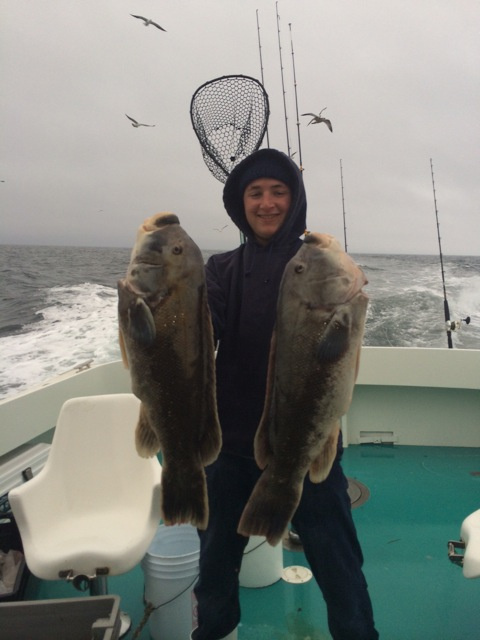 Rhode Island Tautog fishing or Blackfish fishing in Narragansett Bay, Newport, and Block Island has to be our fishery of choice. Each year I like to promote a particular fishery that has been or will be a consistent winner. 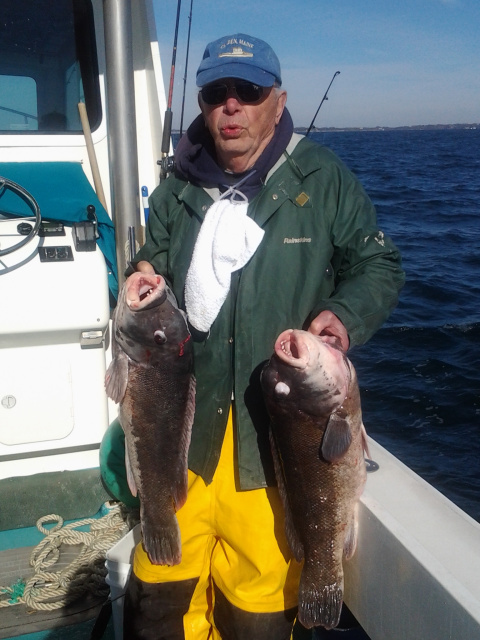 Without a doubt, this year’s choice has to be the RI tautog or as the local Rhode Island fishermen call them, blackfish. The fishery appears to be holding up quite well due to successful management of the fishery by the D.E.M, with its 16” minimum size limit and a 6 fish/person bag limit. 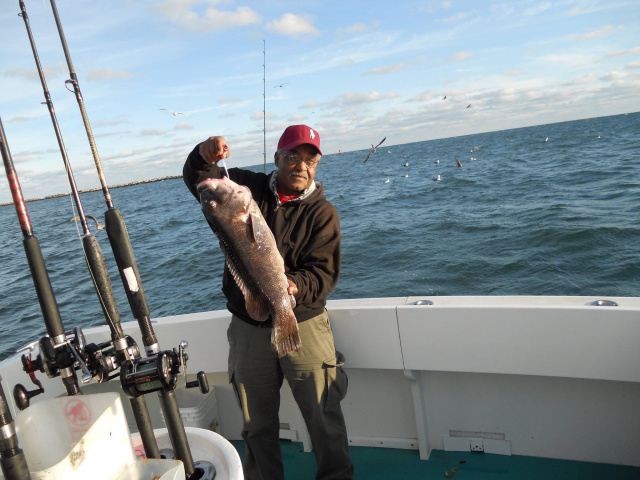 Most of the RI tautog / blackfish fishing charters take place within three miles from land. We are generally fishing 45 minutes after leaving the dock. Fishing close to land allows for much more fishing time as compared to the traditional 25 mile run for cod. My favorite areas are just south of Newport and around Block Island. With a prevailing northerly wind during the fall months where the wind is coming off the land, the sea conditions are mostly calm. Groups of 10 passengers can comfortably fish at the same time when on the anchor. The only downside of late fall fishing is the morning cold. If you dress like you are going skiing, you should be fine. Usually by 8 or 9 AM, temperatures will warm up. The serious fisherman will use an 8 ft. light weight, but stiff rod using 20-30 lb. test braided line. The depth of water we fish will be between 30 and 100 ft. We generally use between 5 and 8 ounce sinkers. Green crabs and jigs are the bait of choice. Blackfish are very strong fighters for their size. Average weights usually run between 3 and 5 lbs. with larger fish in the 7 to 10 lbs. range. The largest blackfish in 2014 weighed in at 16 lbs. Catching a blackfish requires one to stand with both hands on the fishing rod. The bite can be soft which will frustrate the first timer. While veteran fisherman of this fishery may have a few fish in the boat, a beginner may only have an empty hook to show for all of their effort. Personal fishing tips on a one to one basis from the captain and mate should improve the catch rate. On the way back to port, the mate will fillet the fish. After deboning the fillets, they will be washed in salt water and bagged. The white meat fillets have a mild taste and will freeze well for a tasty meal, months after they were captured. The blackfish season opens officially on August 1st. Anglers are allowed 3 fish/person. The fishing opens up to 6 fish/person on Oct 21st and closed on Dec 15th. The discount price for individuals is $135. A private charter consisting of 7 passengers is $950. Fishermen who fish with us on 4 different trips in one season receive a free fare on their 5th trip. A special trip called “Search and Discover”will be offered. I will be targeting new areas within 16 miles from Pt. Judith. These trips will run between 8 and 9 hours at a cost of $120/person. We will make approximately 5 stops per day spending 45 minutes each time the boat is anchored. The first half of the day will focus on new areas to fish. If the action is slow, we will fish the second half of the day on our regular spots. The below schedule of dates is for your convenience. Please refer to our “Fishing Rates” page for more information.